This and all covers ©Edgar Rice Burroughs, Inc.
Toward the end of the Dell Comics run, this tall, bold sans-serif logo was introduced, accompanied by a nice script version of the creator’s name that had been in use for a while. Though prone to being partially covered by art, as here, I think it’s a marked improvement over the previous Dell Tarzan logo, seen in part 2 of this logo study. While very simple, it does have class. In 1962 Dell’s distributor split off and formed Gold Key comics, taking many of the licensed properties with them, including Tarzan. Gold Key covers were usually painted, as above, allowing scenes that could never happen in a film, and probably attracting buyer interest. I know I found them attractive as a kid, while the photo covers usually didn’t appeal to me. The logo is the same one Dell used, just not as tall. The rest of the type on the cover has taken a step backward, though, becoming more uniform and boring to my eye. 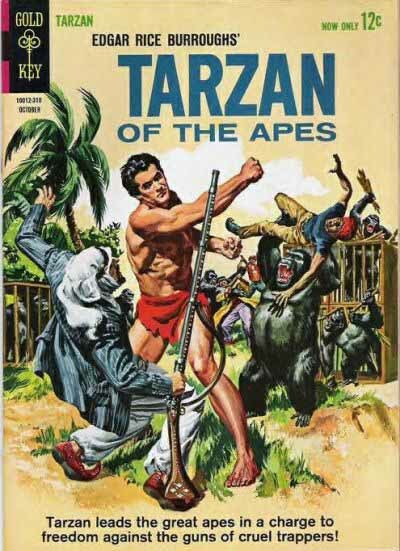 A few issues later they added “OF THE APES”, signalling a return to Tarzan’s roots in the early books, I think. 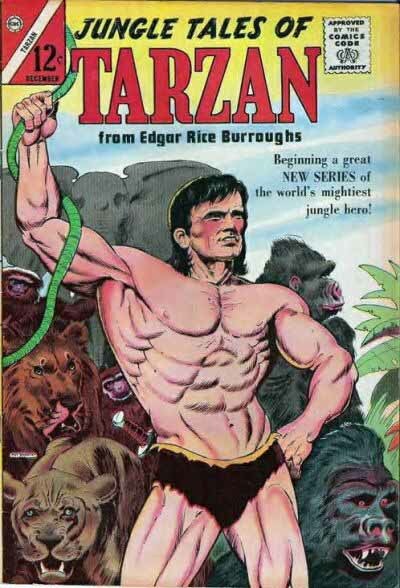 While this cover is full of realistic action, I can’t help thinking that the figure of Tarzan looks more like a posed model than a fictional jungle man, but maybe that’s just me. Note that Gold Key continued the numbering from the Dell run, by the way. 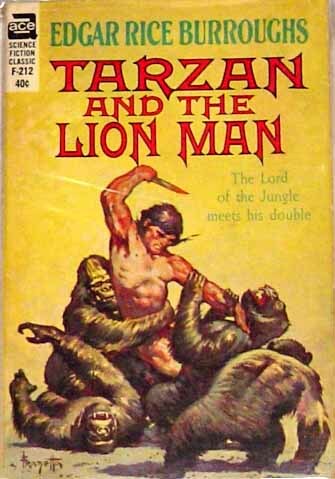 Late in the Gold Key run, a new Tarzan TV series gave them the chance to return to photo covers and try to grab some tie-in sales. The logo has become a rather boring serif font, and once again the rest of the type is equally boring sans-serif over an ugly layout of colored boxes. I never saw any of these as a kid, but if I did I’m sure I would have found them unappealing. And Ron Ely, the TV show star, is showing off a rather underdeveloped physique here that does nothing to bolster his or Tarzan’s image. “Exciting Action”? All I see are two guys tied to trees and a chimp. 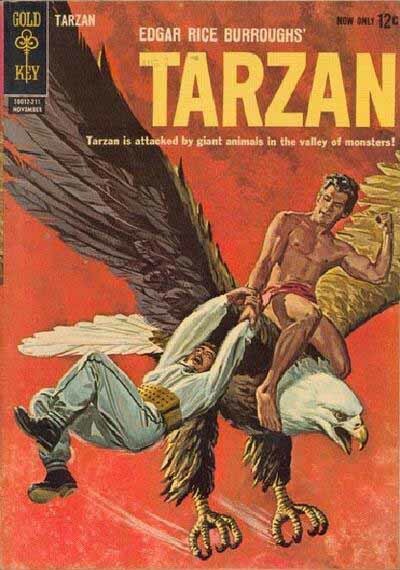 Meanwhile, another publisher was having a try at a Tarzan comic. I believe this short-lived four-issue run was not authorized by ERB, Inc., and would probably have been the subject of legal action by them if they even knew about it. Notice that the logo has no trademark or copyright symbol. It’s again a serif font, very similar to the one on the previous Gold Key cover. Perhaps contributing to the lack of success was the particularly unattractive art on the figure and face. Finally, in 1972, the license passed from Gold Key to DC Comics, and the book began a new life with terrific art and stories under the direction of writer/artist Joe Kubert. Somehow DC was able to gain permission to use the newspaper strip logo that had been so successful for United Features since the early 1940s, though even in 1972 adventure strips were in decline and losing their audience. Joe Kubert was a long-time DC mainstay on war characters like Sgt. Rock, and obviously had great love and respect for the characters and the newspaper strip. In fact, Kubert had just completed a run on his only newspaper strip, “Tales of the Green Berets”, and must have had connections in that world, so maybe it was he who acquired permission to use the strip logo. 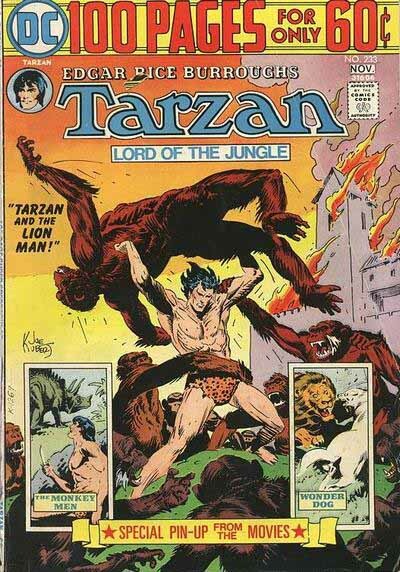 In any case, it helped make Tarzan comics a big success again, gathering a new audience from other DC titles. Kubert’s early issues faithfully adapted the Burroughs’ novels beginning with the first one, “Tarzan of the Apes.” And this is what I’d call an action-filled, exciting cover! Note also that DC continued the numbering from the Gold Key and Dell runs, something you’d never see today when first issues are a big selling point, though they did advertise it as a first with that circular cover blurb, to let buyers know they could jump on board without having missed anything. The early issues of the DC run had a somewhat vertically stretched version of the newspaper strip logo, but when the book went to 100 pages, they returned to the original strip logo to save space. While the rest of the cover has rather bland type, and an overpowering top banner, the strip logo still makes it work for me. The great Kubert cover art sure doesn’t hurt. …these UNauthorized Ace paperbacks with much better title designs, and terrific cover art by Frank Frazetta and Roy Krenkel. The reproduction was lousy, the images were tiny, but they still had miles more impact and appeal than the Ballantine ones. I tended to buy the Ballantines new, and pick up the Ace ones used, myself, for the cover art alone. I liked the titles, too, which used two commercial fonts with lots of visual appeal, a condensed rounded one for the author name, and a spiky serif one for the book titles. Then, unlike the over-art-directed Ballantine covers, they let the art breathe. Great layout! Next time we’ll follow Tarzan comics and books to more publishers as we wrap up this logo study. This entry was posted in Logo Studies and tagged Edgar Rice Burroughs, Joe Kubert on December 11, 2007 by Todd. The following book has select letters of a font similar to Alexandra. A digital interpretation of Alexandra is available under the name, Mephisto. When Alan Weiss asked me to design the logo for his character, “War Dancer” (Defiant Comics, 1994), he mentioned that he liked the typeface used on the Ace ERB paperbacks. I obliged and lettered “Dancer” in that type style. Thanks, Alex. I have a version of the font, too, with a different name, but didn’t know the origin. Oh, and I did an homage to the Ace paperback cover design on the cover of Tom Strong issue 5. 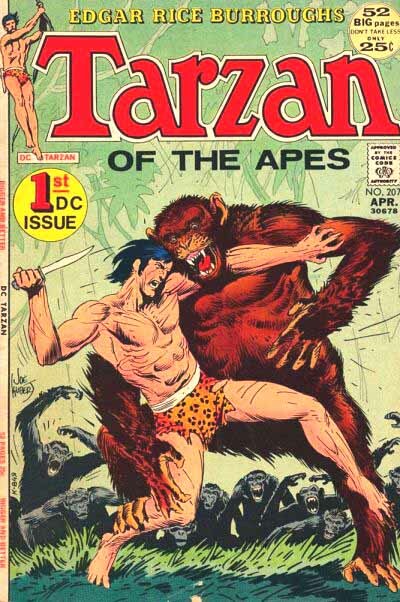 The Charlton TARZAN comic was unauthorized. Someone at Charlton thought the character had become public domain. The Burroughs Estate took legal action. Charlton dropped the comic. Just recently, I stumbled across a 19th-century ATF specimen book which also had that typeface in it; there, it bore the name Washington. Now that I am at home, I can give more specific information: it was the “Pacific Coast Blue Book”, from 1896. Washington is shown on page 443, followed by more condensed versions of the same style called Jefferson and Lafayette. The font used for the DC comic is almost identical to a font called Prodigal. It was also used for the Ballantine Books Tarzans that came out in the Late seventies however the Letters were all Capitalized but the same font was used. Another name used for that same font is Windewood. I haven’t been able to find out how old it is, or who designed it, I suspect the original name was something else. 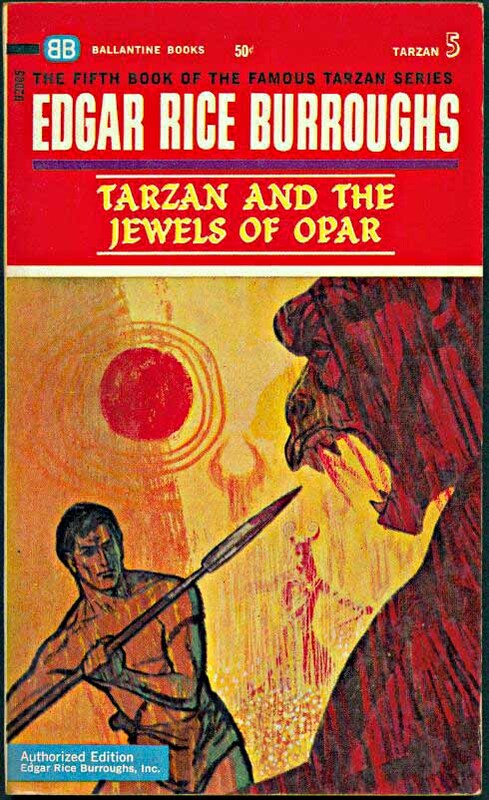 I also think it’s quite possible the font was created using the hand-drawn Tarzan logo from the 1940s (which is what appears on the DC Comics) as a model.